Hello and welcome to the 31st installment of the SWD. Unfortunately today is the 6th anniversary of the war in Syria, we can all hope that it doesn’t reach the 7th one and that peace and stability return to Syria as soon as possible. SAA Tiger Forces advanced south of Kweires airbase and captured villages of Umm Zulaylah, Tell Ayoub, Hazzaza and Al-Karayn. With this move villages of Tell Ahmar and Asimiyah west of the aforementioned captured villages, are now besieged and should be captured by SAA soon. IS could have withdrawn from the area south of Kweires in order to gather the biggest garrison for Deir Hafer, with that in mind all the IS-held villages in Kweires area could be empty and are just waiting for SAA to enter them. Even more advances were made by SAA east of Palmyra, Qalat al-Hari and entire Jazal area with surrounding hills have been captured from IS. Clashes are happening near Jabal Mazar as SAA tries to advance on it. 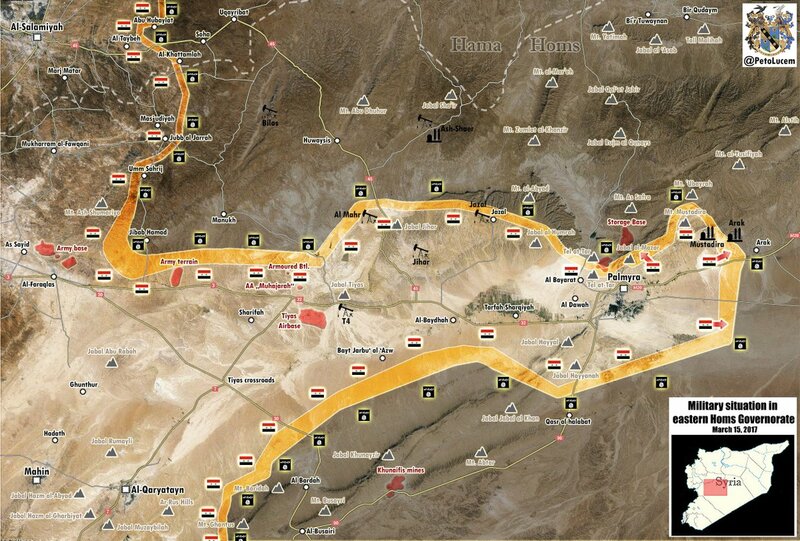 Part of these recent advances is towards Arak, however, it is still unknown if this is a part of the operation towards Deir al-Zour with first phase securing Arak and surroundings or just a small operation aimed at securing Palmyra’s surroundings to avoid the previous scenario when IS was able to capture the city and force SAA to withdraw to T4 due to thin salient created during the first capture of Palmyra. IS counterattack in eastern Raqqa governorate towards Khass Hibal managed to take Grain Silos from SDF, clashes are ongoing in the area. Just four days after the twin suicide Damascus has been hit by two suicide attacks again today. First attack was in Al-Hamidiyah and it targeted courthouse, second attack targeted a restaurant in Al-Rabwah. Casualties from today’s attacks are estimated at 34 killed and at least 104 injured. IED was found and dismantled under a bridge near the main bus station, it was most likely a third planned attack by the same organization, however, there is still a chance that it’s not related to the bombings that took place earlier and could be a separate incident. Today’s attacks in Damascus remain unclaimed but main suspects are known; Hayaat Tahrir al-Sham and Islamic State, there is a bigger chance that it was the former as the group claimed suicide attacks that happened in Damascus four days ago. After securing the old bridge yesterday in “old Mosul” Iraqi army continues to advance in the district towards Ras al-Kor neighborhood. 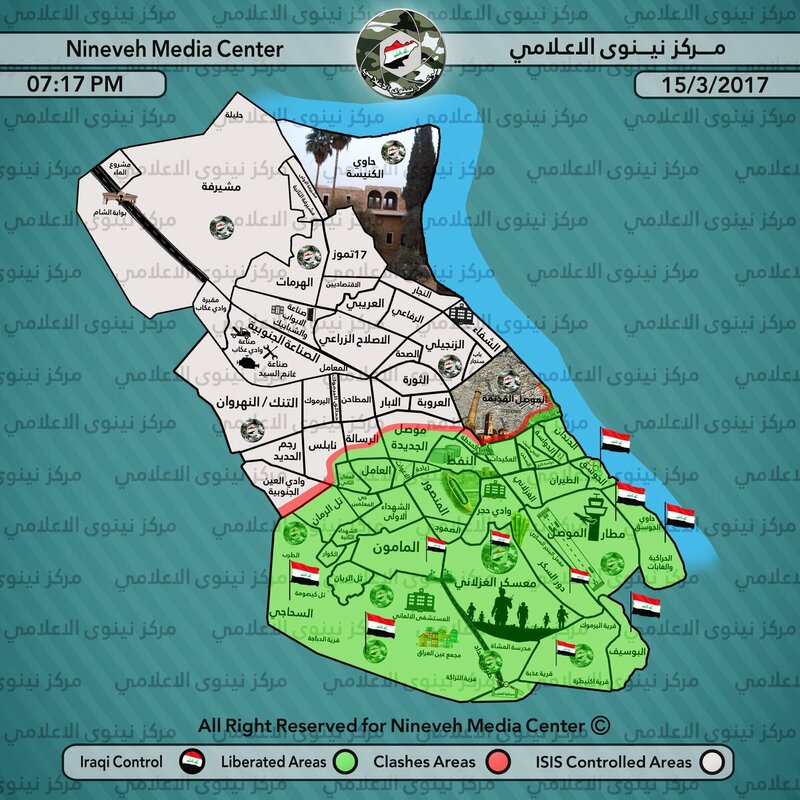 Clashes continue in the west Mosul on multiple fronts with no other reports about successful advances by Iraqi army in the city. Huge military victory by the Iraqi army was achieved today west of Mosul quicker than anyone expected. Badush has been liberated thus finally liberating whole IS pocket created there. Now with the capture of Badush road lays open for PMU towards Tal Afar where they are expected to lead operations to liberate the city. Tal al-Rais village west of Mosul was liberated by Iraqi army and PMU. Car bomb exploded in Tikrit, Salah al-Deen governorate killing 7 and wounding 43 civilians. Following the attack Iraqi forces imposed a curfew in TIkrit. This was already said on numerous occasions but it should be repeated, as IS gets weaker and a step closer to defeat attacks on civilians are unfortunately becoming a common occurrence. On the 14th of March 2017 CJTF-OIR has conducted 12 strikes in Syria. CJTF-OIR‘s main focus in Syria at the moment is Deir al-Zour-Raqqa region where they did 12 strikes supporting SDF‘s operation against IS destroying eight wellheads, four pump jacks, three oil tanker trunks, four fighting positions, an IS-held building, and a vehicle and damaged two pump jacks, a wellhead and two supply routes.